Keystone species are strongly interactive species with a disproportionately large effect on other species in an ecosystem. They are irreplaceable in a community, because of unique interactions and coevolved relationships within an ecosystem. Ground squirrels are recognised as keystone species in grassland ecosystems. One of the most threatened, the European ground squirrel (Spermophilus citellus), is the host of a few coprophagous scarab beetles (Scarabaeidae), and this relationship represents an example of strongly interrelated species with high dependency on the keystone species. 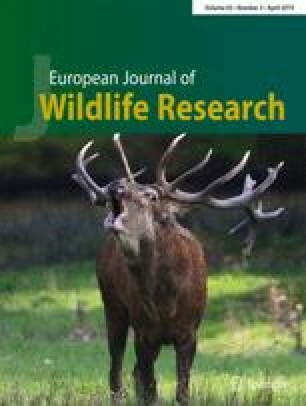 The aims of this case study were to conduct an inventory research of specialised coprophagous fauna associated with the European ground squirrel as keystone species and examine whether translocated colonies of this keystone species fulfil the keystone role also in a new environment. We described keystone effect as the presence of strongly associated coprophagous fauna on the study site. We selected nine relict colonies and three translocated colonies in the Western Carpathians in inventory research of specialised coprophagous fauna associated with the European ground squirrel. We found that all relict colonies and one translocated colony were occupied by strongly associated coprophagous scarab beetles. Investigation in two translocated colonies showed the absence of strongly associated coprophagous scarab beetles, which was explained by geographical isolation. We demonstrate that translocation of keystone species may not mean translocation of the keystone effect into new environment. Our results point out that the decline of ground squirrels may represent a threat for biodiversity in grassland ecosystems, because it affects the ecologically interrelated species, such as specialised coprophagous fauna. This study was funded by the Slovak Scientific Grant Agency (VEGA 1/0286/17). This article does not contain any studies of human participants or animals performed by any of the authors.